Glitter Grammy Plays With Paper: Impossible Cards - I am loving making them. Impossible cards are everywhere. It is almost impossible to look at blogs you are following without seeing one. I decided I needed to join the fun and let me tell you, this card has everything I require. 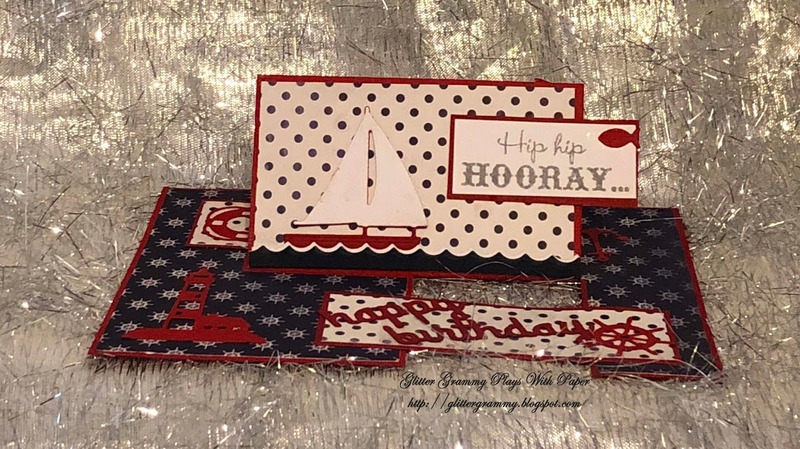 I need something different....something with space to add embellishments and something that won't break the bank when mailing. This is it! This card is 4 1/4 x 6. I saw Jan B make one on YouTube, so I thought I'd give it a go. And I love it. Here's the back and there is plenty of room to write a note. Soooooo on to telling a bit of a story on myself. 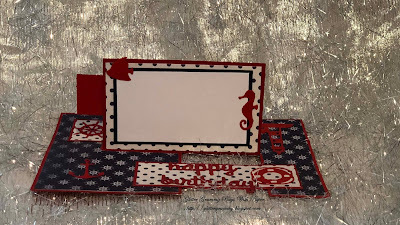 I wanted to use my newest set of frame dies (PoppyStamp Double Stitch Square Frame) which makes making shaker cards so easy. I added a digital die bear and several other dies mostly by Memory Box. I was impressed with how quickly this card came together and I was equally proud of being able to complete a card for this month's challenge even though I'd asked to be excused for one month. Now to make the long story short, I checked my notes for the theme of this month and guess what....It isn't bears. So, I am posting another impossible card, but not for the Sparkles Christmas Challenge. I must say, I do like this Christmas card. Here's the back side with it's sentiment and with a place to add my own greeting. 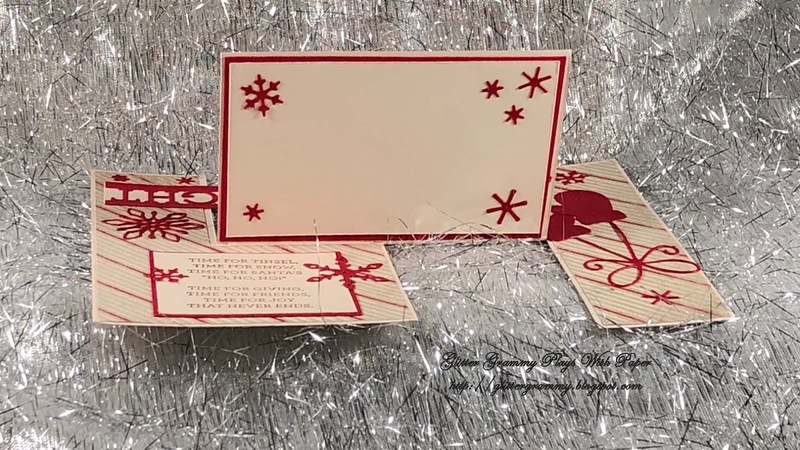 I now have another sweet little card to add to my Christmas stash, but sadly not one for the Sparkles Christmas Challenge. I did learn something that might be a good technique. This larger card was a bit floppy. It just wasn't standing up so I added a hinge to both sides and the problem was fixed. And it's hardly noticeable. If you are using card stock that is of a lighter weight, or if you are adding embellishments that are a bit heavy you may want to think about adding a hinge or two. 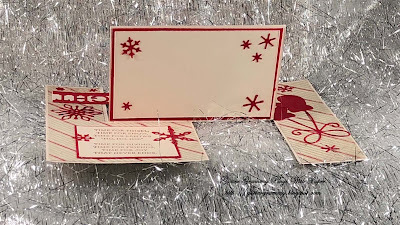 For this card I made mine 1 1/2 inches long and 1 inch wide. I folded the 1 inch side in half to measure 1/2 inch and glued the hinge to the moving part. Well that's it for now. 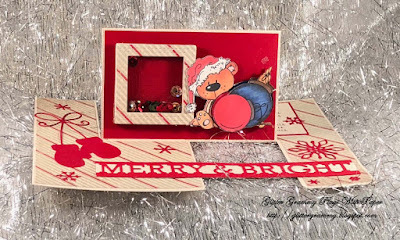 I'm hoping to get a card made for the Sparkles Christmas Challenge. If I don't, I do hope you will check out what everyone has created. So please have a look on May 1st. Until later, hugs and happy crafting. Well now you have me totally baffled as I haven't seen or even heard of these cards yet! My gosh it foes look a bit complicated. I would go and have a look on You tube but staying clear of sites as much as possible right now. I like the top card with its bright colours. Hugs Mrs A.